← Old Glow is dead. Long live Glow. Tomlinson, P. (1989). Having it both ways: hierarchical focusing as research interview method. British Educational Research Journal, 15(2), 155-176. I am steadily working through methodology issues from my review and have submitted a more extended piece of writing on it for a forthcoming supervision. I’m still working on interviews however and am hoping to pilot some very soon. My supervisor has suggested I investigate Tomlinsons’s (1989) method of hierarchical focusing in interviews, and having finally managed to track the paper down, I think it is worth a try. Given I have some, but not huge, experience in interviews, and no experience with hierarchical focusing I think a pilot is essential and I’m hoping to set some up immanently. Tomlinson’s argument is that interviewing in research is far from straightforward data-gathering and can be complex and problematic. The possibilities for misconstruing language and interpretation, the social and relational dynamics of the interview situation, the possibly competing agendas of researcher’s concern with their topic and interviewee’s responses all represent dilemmas and tensions which have to be navigated in the interview situation. Hierarchical focusing is a method of interviewing which attempts to mitigate these tensions by attempting to achieve a balance between “emergence of the interviewees perspective [and] the researcher’s own research agenda” (Tomlinson 1989: 155), hence the perspective of “having it both ways” from the subtitle of the paper. Carry out the interview using the hierarchical model in an open-ended way; adopting a non-directive, non-judgemental style and not paraphrasing what is said but sticking to terms used by the interviewee. Start with the outline of the domain. What are the main concepts involved in this piece of research? What terms are being used? How do these ideas inter-relate? This will provide a hierarchical structure for the interview to be built around. 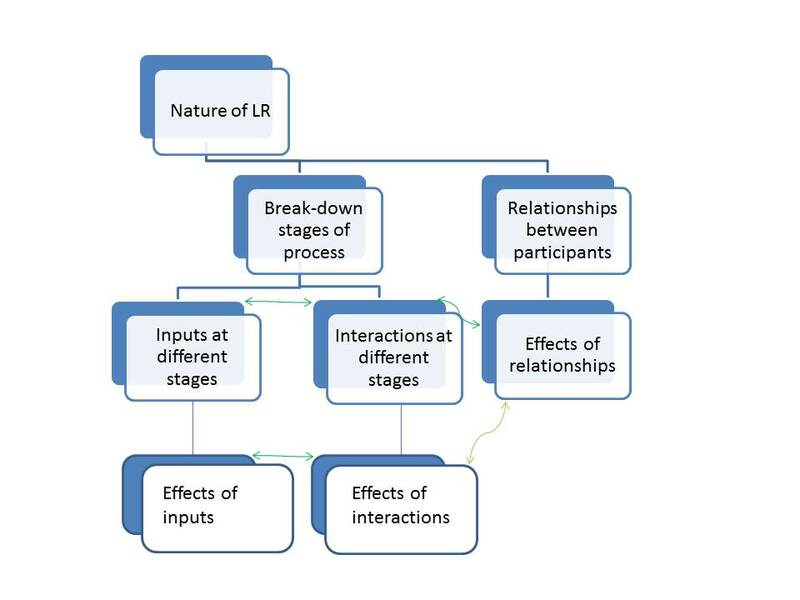 To try to give a very simple example this could be: the nature of learning rounds; the outline of the different stages of the process; the relationships between participants; the actions and interactions at each stage; the effects of these interactions. From this I would work on questions which are designed to ensure that all aspects of my concepts as illustrated above are elicited. This schema shows that there is a movement from generality (conceptual) to specific( contextual) understanding of the research problem. A thoughtful and fulsome approach to question construction is required. The conceptual provides the starting point in hierarchical focusing, and the process moves iteratively from there to more contextual framing. Encouraging open-ness and deploying a non-directive approach is essential.Only when all possibilities and any spontaneous development of the themes concerned with a particular set of questions has been exhausted do I move to the next more specific level in the hierarchy, where the same process is repeated. I also need to construct a recording framework to annotate spontaneous, prompted or partial responses. This serves as a reminder to return to questions which elicited only a partial response before moving to the next level, and also to track the different responses in order to remind me what to return to for more developed answers before moving on. Helpfully this sets up the beginnings of a system for initial analysis of the data. There is lots I need to refine about this, but I’m feeling hopeful that it will offer a robust, systematic and justifiable method to support my forthcoming interviews. I’d love to hear from anyone who’s already used it. This entry was posted in Learning Rounds, Methods, PhD, Research and tagged Hierarchical focusing, interviews, research, Tomlinson. Bookmark the permalink.